Two missed spot kicks in a penalty shoot out saw Cumbernauld go out of the West of Scotland Cup against Kilwinning Rangers on Saturday. The match ended 1-1 but was a third round tie United should have won against a Kilwinning side unbeaten since September. A big powerful Rangers outfit put the home side under early pressure, but United settled and a great Dylan McGuigan and Mikey McLaughlin move saw Scott McHaffie’s goalbound shot blocked. Davie Dickson, following up, shot just past. But in the 10th minute the Ayrshire men went ahead with a fine individual goal as Isaac Kerr ran from midfield through the Cumbernauld defence to score, albeit with the help of a slight deflection. Neither ’keeper was seriously tested for the remainder of the half but after the break United had a quick opportunity to equalise. A Dale Clark corner and a Ross Foley pass found Steph McDonald but the big striker’s left foot effort cleared the bar. United were playing some excellent football and a great Clark run released Dom O’Halloran but Kilwinning ’keeper Adam Strain left his goal quickly to block the Cumbernauld man’s effort. In the 60th minute O’Halloran had another opportunity to square the match when a McHaffie pass saw him in the clear but this time Strain’s foot came to the rescue to divert the ball for a corner. United were well on top and Kris Irvine replaced McDonald as the home team kept up the pressure. In the 75th minute United got their due reward with a brilliant effort from Clark. The slightly built winger went past a couple of defenders and then sent a wonderful shot past Strain in the visiting goal. United came near to grabbing a winner in the closing minutes but lost in the penalty shoot out. 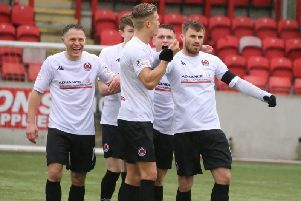 Cumbernauld goalscorers from the spot were Kieran Brown, McLaughlin and Dickson. This Saturday Cumbernauld travel to Rutherglen to face Glencairn in a Super League First Division fixture, kick-off 2pm. The United supporters’ bus will leave Guy’s Meadow at 12.25pm and the town centre at 12.30pm.